Asian soup has always fascinated me. Hearty warm soups are generally something that hit the Western dinner table when the temperature drops and the frost sets in. In winter I grew up with soups on the weekends. Mum would cook up vegetable based soups like broccoli or mushrooms and the house would fill with delicious smells as the soup cooked away. I can almost taste that creamy mushroom soup as I sit here and think about it. In Asia though soup is a year round affair. With no regard for the 35 degree heat or the ninety percent humidity you will find locals across Asia sitting out on the streets on those funny little stools enjoying the local soup. This really hit home to me in Vietnam where there really does seems to be a serious love story between the locals and soup. Whilst Vietnam has a wide range of soups, the soup that has travelled from Vietnam around the world and you will likely be most familiar with is Pho (pronounced fur). The hearty beef broth cooked for many hours and then garnished with thinly sliced beef, fresh herbs and bean sprouts has found a place in the hearts of people around the world. My own obsession with Pho does mean frequent trips to our local Chinatown. I just can't seem to get enough. I have cooked my own Pho a number of times but when you take the cost and effort involved and put it head to head with the experience of getting a bowl from a Vietnamese restaurant for $10 that really does testament to those authentic flavours I just can't justify the effort of making my own very often. With hundreds of bowls of Pho having already passed through my digestive system it is about time to explore what other soups Asia has to offer. With recent success in cooking and immensely enjoying Filipino cuisine it seemed like a great place to start. Filipino cuisine is fascinating and you can read more about my first impressions on it here. 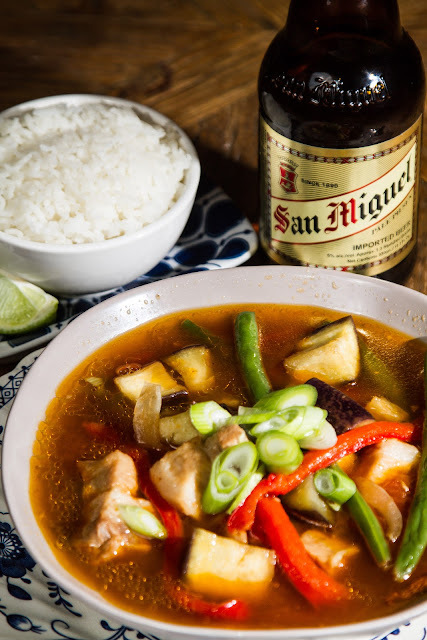 It's distinct sour flavour profile certainly does appear in what could be considered a national dish "Sinigang". With some pork belly laying in wait in my fridge I decided to put my trust in my favourite Filipino cookbook 7000 Islands by Yasmin Newman. Yasmin's Filipino hertiage makes her somewhat of an expert in the cuisine and I have been so impressed by her Adobo recipes I have cooked them again and again. You can actually get your own copy of the Sinigang recipe I used right here. Yasmin explains that the recipe comes from Richie Gamboa of the 21 Restaurant in the city of Bacolod but she decided to add pork ribs to add some more flavour to the broth. I decided to take it one step further. I wanted a really meaty broth with a great depth of flavour. It may not be totally traditional to make the Sinigang this way but boy it was tasty. So I took a couple of kilos of porky bones. I used some pork hock that I had leftover in the freezer and bought some smoked bacon bones that our local butcher sells. I added those to around 4 liters of water along with some additional asian flavours like chunks of ginger, lemongrass, carrots, onions, shallots, celery. Whatever you have at hand is fine and it is a great way to get rid of leftovers floating around the fridge. I decided I would make mine a 24 hour slow cooked broth so I popped it on the stove on a very low simmer and when ready I strained out the chunks and there you have a wonderful pork stock to use as the base for your Sinigang. Don't be afraid to take a great recipe and take it on your own unique tangent. This is easier to do as you get more familiar with flavour combinations but the best way to learn is just to experiment and find out what you like, because in the end, it is all about you! So from there I basically followed Yasmin's recipe. I left out the pork ribs as I didn't have any on hand and didn't want to spend the additional money (I'm a bit of a tight arse!). The recipe was very quick and easy and the results were a dish unlike anything I have eaten or cooked before...which is basically my sole purpose for being. The tamarind brings a tartness and set against that meaty porky broth with hints of ginger and lemongrass you have a flavour profile that is wonderfully complex. The green beans give you a crisp fresh burst and the pork belly has that delicious decadent fatty quality and the two offset each other perfectly. The sweet soggy capsicum and the earthy eggplant soak up the juices and take on a porky tone. I was instantly transported. I can imagine myself on a beach in Boracay eating a seafood version of Sinigang with big juicy prawns and chunks of white fleshed fish or a bustling street stall in Manila slurping up the meaty goodness surrounded by enthusiastic hawkers and wild traffic. You can go there too. Just get in the kitchen and get cooking now!